The Cards fall to 8-3 in ACC play. A season-high 23 turnovers doomed Louisville in an 80-75 overtime loss at No. 22 Florida State Saturday night. 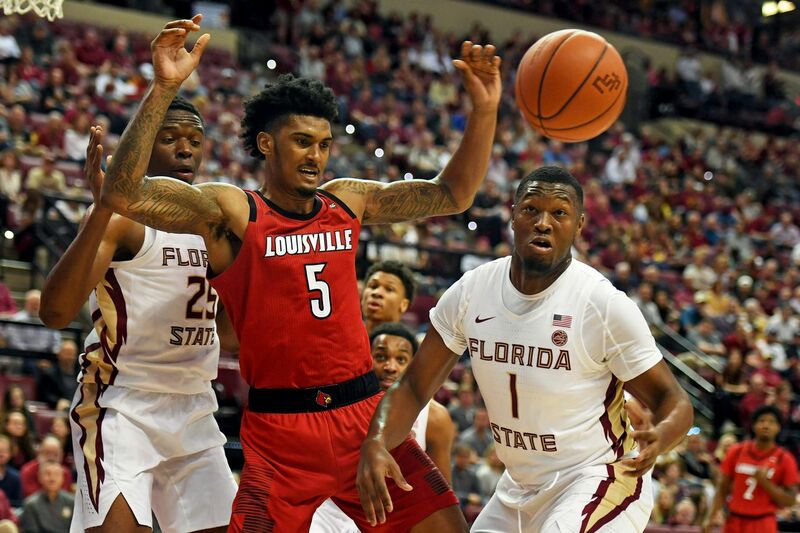 The Seminoles outscored the Cardinals by a whopping 32-5 in points off turnovers, allowing them to make up for the fact that they shot just 37.7 percent from the field. Louisville connected on 48.1 percent of its shot attempts, making this the first time all season the Cards have lost a game in which it shot a better field goal percentage than its opponent. The Cardinals were also outscored 27-13 at the free-throw line. For most of the evening, it looked as though U of L would be returning to the Derby City with its ninth conference win. The Cardinals carried a 6-point lead into the locker room with them at halftime, and led by 10 with less than nine minutes to play. With just over a minute to go, Florida State made up a four-point deficit in a matter of seconds. First, they scored on a baseline drive and dunk by Mfiondu Kabengele, who finished with a game-high 22 points. Moments later, M.J. Walker pick off a bobbled pass by Christen Cunningham under the FSU basket, and easily laid in a game-tying bucket. Cunningham made a pair of free-throws on the other end to give Louisville back the lead, but Florida State answered with a hoop from Trent Forrest. A forced shot from Jordan Nwora in the final seconds found nothing but iron, as did Phil Cofer’s shot at the buzzer on the other end of the floor. After allowing Florida State to score the first eight points of overtime, Louisville got as close as one in the game’s final minute. A potential game-tying three from Ryan McMahon in the closing seconds caromed off the back iron, and with it went U of L’s chances of pulling off a second straight road win over a ranked opponent. Still love this team and still feel great about the overall position we’re in, but this one’s going to sting for the rest of the weekend.